Fire Extinguishers are portable canisters that are filled with special chemicals that are designed to smother certain types of fires. 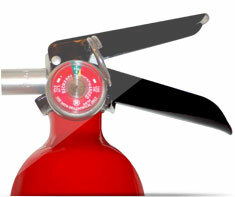 Fire extinguishers are the first line of defense against small fires. A small fire can grow into a big fire in just a matter of seconds. There are four basic types of household Fire Extinguishers: Type A: for use on fires involving combustible materials such as wood, cloth and paper; Type B: for use on flammable liquid fires, including kitchen grease; Type C: for use in fires involving energized electrical equipment; and Type ABC: for use on all of types of fires mentioned here. Shown in the 'Routine Care' section are the recommended routine maintenance tasks for your fire extinguishers. The 'Q & A' section shows answers to common questions. And the 'Articles' section provides helpful articles about your fire extinguishers.